Talent shortage has been the talk in the HR industry for some time. There’s a solid amount of literature on why companies are missing out on top talent. The truth is, talent shortage is not always the problem– companies often miff great applicants by committing rookie mistakes. When it comes to finding great candidates to fill roles in your company, you need to bring your ‘A’ game. 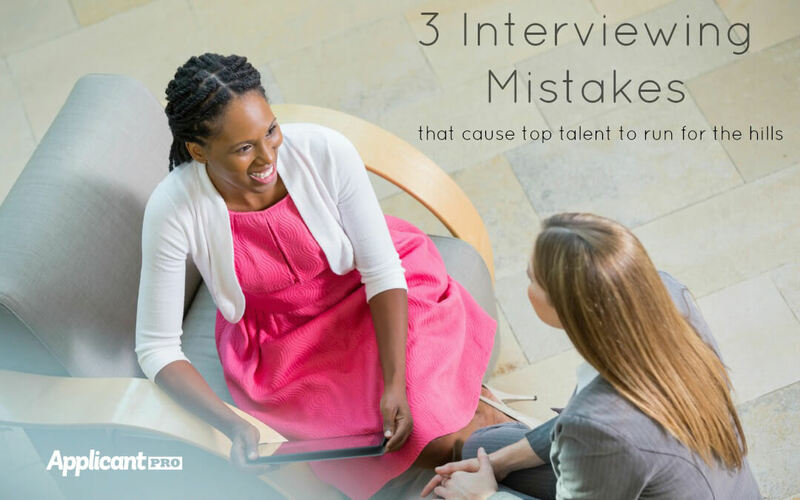 Take a look at these 3 interviewing mistakes to see if you need to sharpen your interviewing chops. Let’s be honest, there are moments where you are so busy and in desperate need for employees that you simply set up a slew of interviews without doing your due diligence. By the time the interview rolls around, you have no clue about the competency of the interviewee. Eager candidates have taken the time to send you their cover letter, resume, and other application materials. Nothing is more discouraging to an applicant than to find that the hiring manager has not taken the time to look over their qualifications. A smart applicant will notice your lack of preparation and may write off your company. Here’s a pro tip: before you conduct an interview, take time to learn about the applicant and how they may best fit into your company. This allows you to have a productive interview and it shows your applicant that you aim to hire a well qualified candidate. You judge an applicant for being late, so it shouldn’t come as a surprise that applicants will hold you to the same standard. In addition to it being plain rude, keeping a candidate waiting for a long period of time sends the message that you do not respect their time. For your interviewer to sidle in considerably later than you agreed on, without an ounce of contrition, is a major red flag. “If they’re this rude at the interview, imagine how they would be as a manager,” Dana Manciagli, a career expert explains in LearnVest. This is a question that an applicant with solid deductive skills will ask themselves. Try not to deviate from the scheduled appointment time. Of course, should something unexpected occur, notify the candidate so that they are not left miffed waiting in the lobby. A general misconception about the interview process is that the applicant needs to sell themselves on why they are a good fit. While this is part of the equation, hiring managers would do well to sell their company to their applicants as well. Applicants who possess talent understand the contributions they will make to their potential employers. They are looking for companies to appreciate their skillset and conduct the interview accordingly. You have a great company story and assume everyone will want to work for you. Make sure the people involved in the interview process realize the importance of “selling the job”. Pitch the benefits of your company and how top employees can flourish in that environment. Hiring managers can connect with applicants at a faster rate than before. If you seem to have an issue with finding the right people, re-evaluate your process. Be sure to research your candidate, start on time and explain why the applicant would want to join your company. Keep the interview process engaging and mutually beneficial and the top talent will soon follow. For more tips on interviewing, click here. Hiring challenges can be time consuming! Try our 3 step approach to thinking outside the hiring process box and increase your qualified applicants today.